In my last two posts, I highlighted the rising tail-risk from the protests in Hong Kong (see The Big Kahuna Korrection, or buy Yom Kippur? and HK tail-risk is rising). While the markets focuses on the actions of the ECB and the US Employment report this week, the risk of the derailment of one of the three key engines of global growth, namely China, is heightened. The most violent protests in Hong Kong in almost 50 years pose a dilemma for President Xi Jinping: clear the streets and risk embedding anti-China sentiment in a city that has prized its relative freedom, or make concessions and appear weak at home. 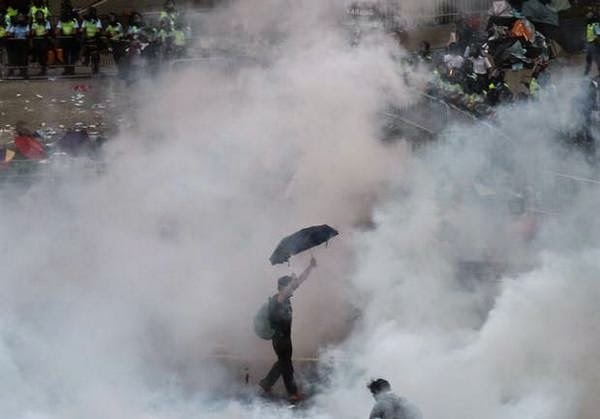 Thousands of protesters have remained on the streets, refusing to back down after Hong Kong police on Sept. 28 fired tear gas and pepper spray in the worst clashes since unrest swept the city in 1967, led by pro-Communist groups inspired by Mao Zedong’s Cultural Revolution. The protests prompted banks to close branches in the central area and pushed the main Hong Kong stock market index down a further 1.4 percent today. As China prepares to celebrate the 65th anniversary of the establishment of the People’s Republic of China, Xi may want to demonstrate his grip on power on the mainland as he presses an anti-corruption drive that has snared senior officials and seeks to curb separatist sentiment in the Xinjiang region. Even so, acting forcefully to quell the protests may threaten Hong Kong’s standing as a city where businesses prize the rule of law and citizens cherish their freedom of expression. As well, Xi has to consider the risks that protests could spread to nearby Macau, or even China itself. If he does intervene forcefully, then he can kiss the dream of Taiwan reunification under the Hong Kong formula of ”One Country, Two Systems” for a generation. Third, Beijing may use violence, perhaps real bullets, to crack down, in a Tiananmen-like confrontation. This is the least desirable outcome for both Hong Kong and Beijing, as it would stifle relations between the two regions for some time to come. It would dampen trade and investment with Hong Kong, harm the stock market, which contains a large percentage of Mainland-based companies, and put the Shanghai-Hong Kong Stock Connect program on ice. Currently, trade from the Mainland into Hong Kong measured at $384.8 billion in 2013, direct investment from Hong Kong into the Mainland weighed in at $73.4 billion in 2013, and the market capitalization of Mainland firms listed in Hong Kong amounts to $1.8 trillion. Disruption of these financial flows would cause a serious economic shock to both regions. Further, the wider economic implications of a crackdown should also be considered. A shock to the China/Hong Kong trade nexus, combined with an arrest in direct investment into the Mainland, would sharply impact the rest of the world, cutting off access to imported goods from China, and rerouting export channels to Shanghai, creating congestion and reducing exported goods to China. A crackdown would also call for an international response, possibly in the form of a trade embargo, as has been implemented against Russia. This would certainly disrupt trade, and would weaken economic ties between China and the West. Here is my two cents worth on the decision making process. I believe that there are many reasons for the authorities to lean towards using force to resolve the situation. First, the fact that the world is watching is unlikely to much to affect the actions of the authorities. Beijing was full of western reporters in 1989, but their presence did not deter the Politburo`s decision to send in the troops into Tiananmen Square in the face of an existential threat to their authority, which the Hong Kong protests are today. As well, China has evolved since 1989 and they appear to be better prepared for incidents like these. 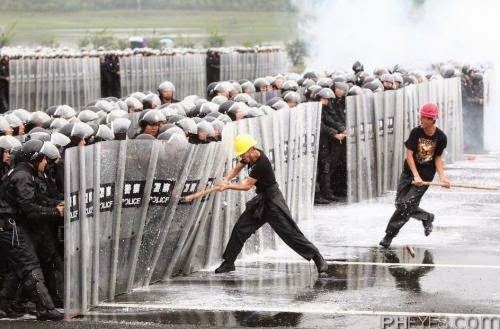 Zero Hedge posted a provocative piece about PLA (People`s Liberation Army) Police Riot units. Note that they refer to a Shezhen based riot police unit, who are typically trained to handle protesters with non-lethal force, rather than the regular PLA employed in 1989, who were not. The presence of these PLA riot police units that could use non-lethal force to put down the demonstrators would serve to mitigate the kinds of outcomes seen in 1989 where PLA units were ordered in and start shooting. In addition, a recent poll by the University of Hong Kong (via the WSJ) shows that the protesters do not enjoy majority support. Only 27% of Hong Kongers agreed with the Occupy Central movement while 54% disagreed. This will serve to give Bejing the moral authority to put down what might be perceived as an unpopular insurrection. Lastly, there is the matter of the Chinese culture and character that I have not seen talked about in much of the analysis that I have read. These protests are occurring at the start of the Chinese national holiday commemorating the Mao Zedong Communist Liberation of China. Moreover, the protesters have given an October 1st deadline, the day of the national holiday, for the current HK executive CY Leung to resign. As well, this week marks the start of Golden Week holiday, when many Mainlanders go to Hong Kong to shop. Moreover, the protesters have boxed themselves in a corner so that HK chief executive Leung has nothing to offer them. In effect, these protests are a direct affront to Xi Jinping and will cause him to lose face. 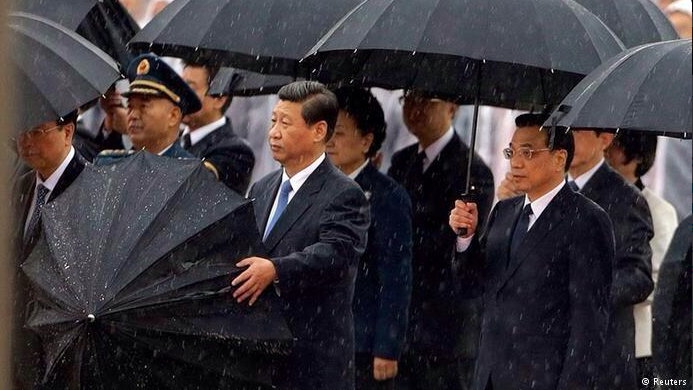 You don`t provoke a major Chinese leader and make him lose face without suffering consequences. Such actions are likely to cause emotional reactions that go beyond the normal political and economic calculus that accompany such decisions. I hope that I am wrong, but I fear that events are likely to turn out in a less than benign fashion. Neither side seems to backing down and we will either see a settlement or a violent confrontation in the next few days. The outcome will be critical for the fate of Hong Kong, Macau, China, Taiwan and the growth outlook for the Asia-Pacific region. In yesterday's post (see The Big Kahuna Korrection, or buy Yom Kippur? ), I wrote that, based on my interpretation of sentiment indicators, the US stock market appeared to be getting close to a bottom. However, there is a chance that the market could fall further if a bearish catalyst were to appear. Over in Asia, how will Beijing react to the latest developments in Hong Kong's Occupy Central pro-democracy campaign? Could China institute a crackdown in a way that would spook the markets. 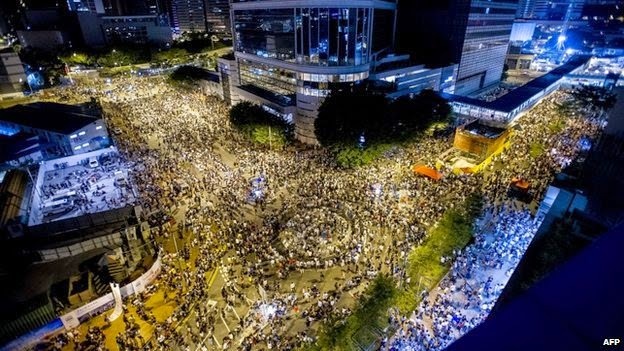 (See my previous post Big trouble in little Hong Kong for the key quote: "The fact that you are allowed to stay alive, already shows the country's inclusiveness"). Since I wrote those words, the Occupy Central pro-democracy movement has clashed repeatedly with police. 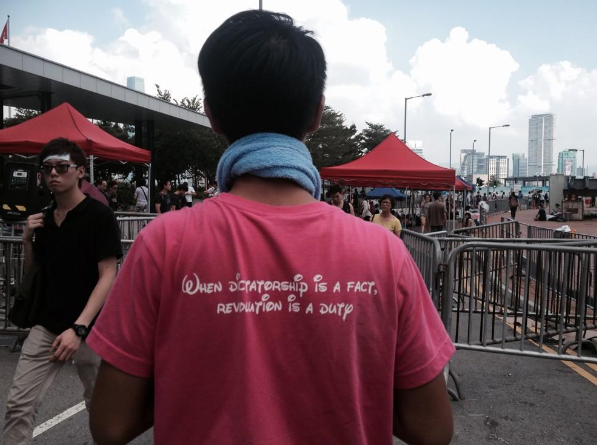 On the other hand, sentiments like the one expressed by this T-shirt represent a direct challenge to Beijing's authority and steers the pro-democracy movement down a very risky road. The good news, for now, is that the HK Police is dealing with the protesters and the PLA has not taken control. 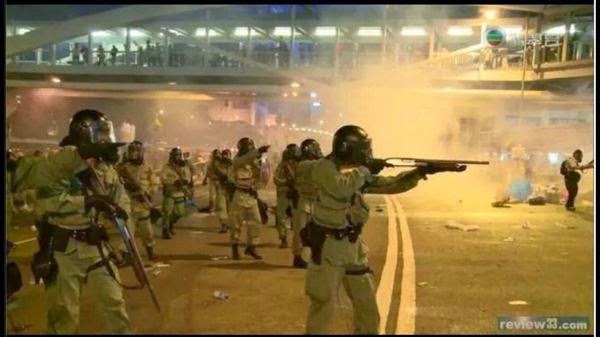 The scenes from the protests are reminiscent of the recent US riots in Ferguson, but the Ferguson riots did not directly challenge Washington's authority while the HK protests represent an existential threat to the Party. Such dissent will not be tolerated. As an example, the news that the HK High Court acceded to a petition of habeas corpus and ordered the release of student protest leader Joshua Wong provided a temporary victory to the pro-democarcy movement. On the other hand, it undoubtedly added to Beijing's discomfort and probably increased its resolve to tighten political control of Hong Kong. The potential for a "mini-Tiananmen" movement to evolve from pro-democracy class boycotts at local secondary schools and universities worries the government, a former chief of the Security Bureau says. 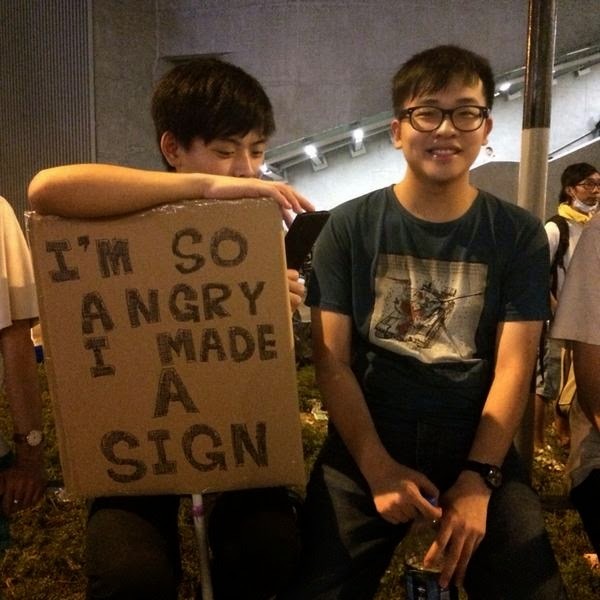 Suspicions have also been aroused in the corridors of power that the students are becoming a tool for Occupy Central to boost its fight for genuine universal suffrage, because it has failed to mobilise support from the middle class, according to executive councillor Regina Ip Lau Suk-yee. But she doubts the pressure will succeed in making Beijing cave in and retract a reform framework laid down on August 31 - ruling out a genuine choice of candidates for voters in the 2017 chief executive poll - despite the political tensions weighing on the Hong Kong government. Ip told the South China Morning Post of prevailing sentiments in the government last week while the class boycotts were in full swing, ahead of the formal launch of Occupy's first operation yesterday. "On the face of it, the students are voicing their demands for democracy and self-determination," Ip said. "I think the worry on the part of the Hong Kong government is, what if it becomes a mini-Tiananmen? Who is behind it?" If there is a crackdown that involves mass bloodshed, the markets will freak out. Risk aversion will go through the roof and China`s growth outlook will tank. At that point, we will then truly see how serious the financial linkages the Chinese financial system have with the West. I am trying not to sound alarmist as events may resolve themselves peacefully. However, to monitor events, I am watching for live updates from the South China Morning Post, whose Occupy Central coverage is outside their pay wall. As well, I am monitoring the AUDCAD exchange rate cross, as Australia is a more China-sensitive commodity producing country than Canada. The AUDCAD has already violated a key support zone and it is showing downward momentum. Watch if the support that I marked holds. Stay tuned and brace for volatility. The events in Hong Kong have the potential to overshadow the ECB meeting and the US Employment report this week. Breaking: The HK government has blinked and has taken riot police off the streets. A statement asks the demonstrators to disperse and go home. While this may be viewed as a positive development, I see this as potentially more serious because the issue of the protesters' challenge to Xi's authority has not been resolved. If the HK police cannot or will not deal with the protesters, how long before the PLA steps in? I would liken the first reason to someone deciding to ride a motorcycle without a helmet. It is risky behavior in the long-run, but it may mean nothing in the short-term as the motorcyclist may not get in an accident. The second would be analogous to the motorcyclist riding around at 100 mph without the helmet. It raises the risk level considerably and the consequences would be dire if there is an accident. The third is are potholes in the road, or the catalyst for the bears to come out of hibernation. So far, while macro analysis suggests that the road is bumpy and the number of potholes are getting more numerous, the motorcyclist hasn`t wiped out. European growth continues to slow. China is slowing and Beijing shows no immediate desire for anything but small targeted stimulus programs. In the US, the growth outlook remains mixed. Several weeks ago, I rhetorically asked, "Is it time to sell Rosh Hashanah" and buy Yom Kippur, in accordance with the old Wall Street adage? At the time, the Trend Model remained bullish, but market internals were starting to deteriorate. The Trend Model did subsequently tactically turn bearish and remains bearish today (see A tactical sell signal, but no signs of a major top). As Wall Street adages go, its past history has been pretty good (via Chad Gassaway). As we approach Yom Kippur (Oct 2-3), is it time to heed the adage, or is the market likely to fall even further? From a tactical viewpoint, oversold conditions are showing up in a number of market breadth based technical indicators, These include the NYSE 52-week New Highs-New Lows, the NYSE McClellan Oscillator and the Percentage of stocks above the 200 day moving average, all of which are shown in the chart below. I have also marked (in blue vertical lines) previous instances where these indicators have all flashed oversold conditions at the same time that have have marked an interim market bottom. On the other hand, the red vertical lines show past instances when these threee oversold conditions have not marked a sustainable low, when the market rallied briefly and went on to decline again. Note the % of stocks above the 200 dma is unreliable as an oversold indicator as it is difficult to ascertain the level when it is deemed to be oversold. 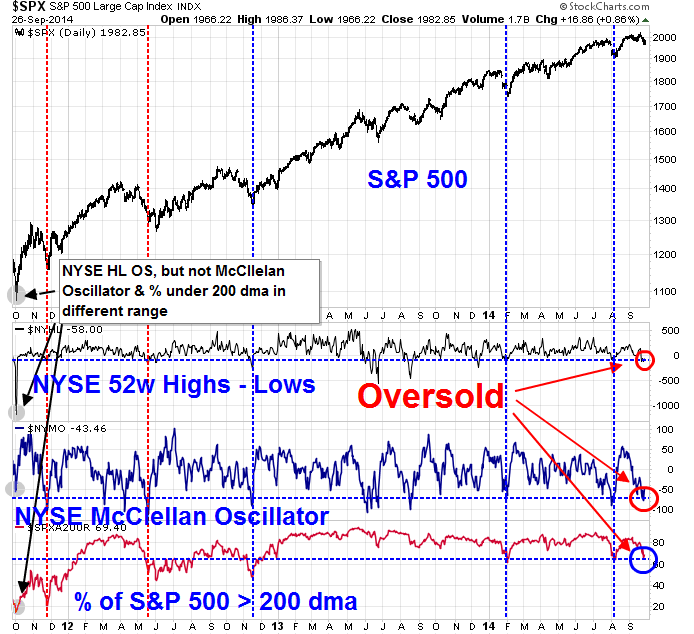 In particular, this trifecta of oversold indicators were unsuccessful in calling the 2011 bottom as only the NYSE HL was the only indicator that flashed an oversold condition, while the McClellan Oscillator was not oversold and % of stocks above the 200 dma was unreliable as an oversold indicator. Remember, oversold doesn`t mean that the market goes up. Oversold markets can get more oversold. For a more reliable method of calling a tactical bottom, I turn to the indicators I used last time to successfully call the previous rally (see A tradable bottom?). The first is the combination of VIX term structure and NYSE TRIN. 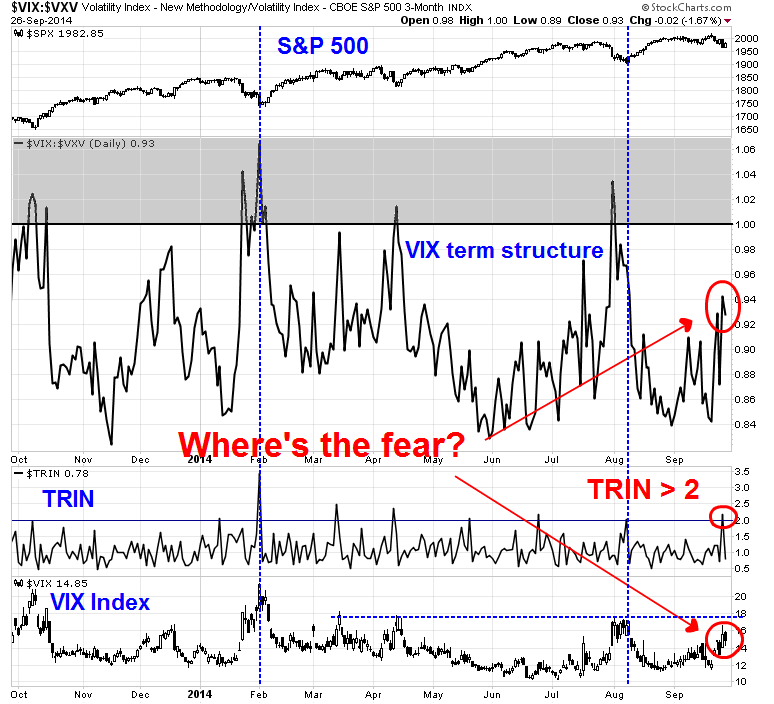 An inverted VIX term structure shows that option players are showing a high degree of fear and so does a TRIN reading greater than 2. As the chart below shows, while TRIN rose above 2 last week, the VIX-VXV ratio as a measure of VIX term structure is far from inversion (shaded zone). As well, the absolute value of the VIX Index is still below previous points that have marked previous interim lows, which are shown by the vertical blue dotted lines when VIX-VXV rose above 1 and TRIN was above 2. The charts in my previous post shows a longer history of the combination of these two indicators, which have had a 100% success in calling interim bottoms (see A tradable bottom?). I interpret these conditions as the market getting oversold, but I would like to see further downside before declaring an interim bottom. 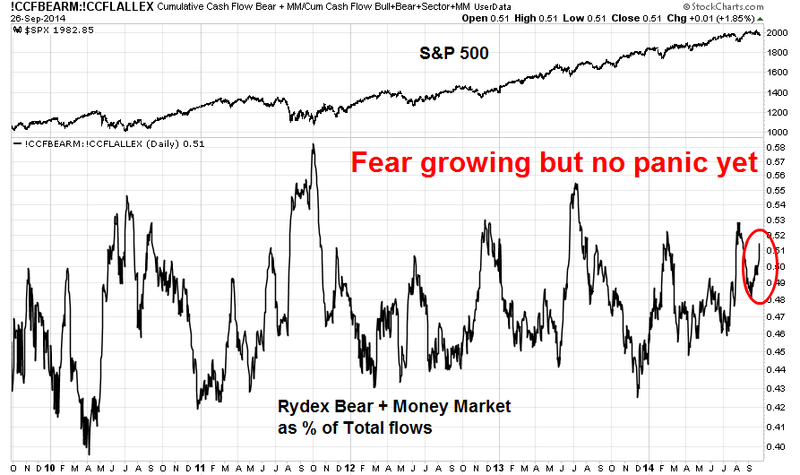 Indeed, other sentiment indicators such as Rydex funds flows, which measure funds committed, instead of investor opinions, are nearing crowded short readings, but they are not quite there yet. The psychological character of this stock market has shown itself where participants are jittery and panic easily. 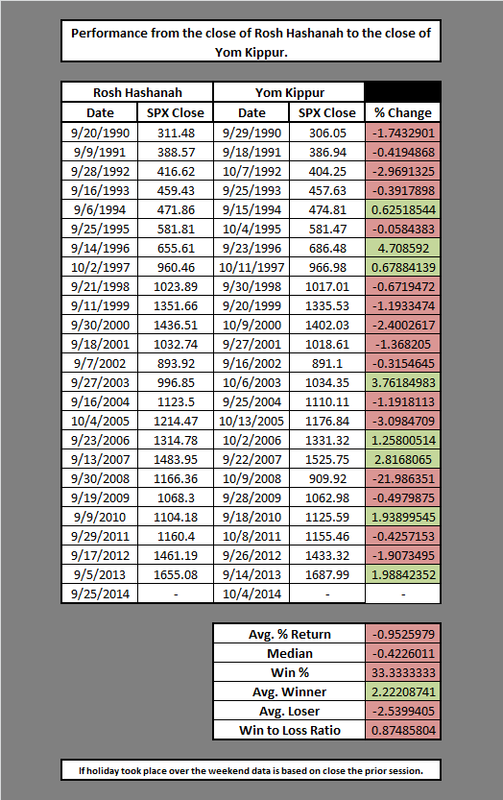 As a result, pullbacks have been extremely mild and less than 5% (whatever happened to the 10% correction?). If it were to sell off in the next few days, then the adage of buying on Yom Kippur might not be such a bad idea. What happens to earnings expectations? We are once again approaching Earnings Season again. Ed Yardeni's analysis showed that Q3 EPS estimates are dropping fast, but he interpreted those conditions as lowering the bar so companies can more easily beat Street estimates. 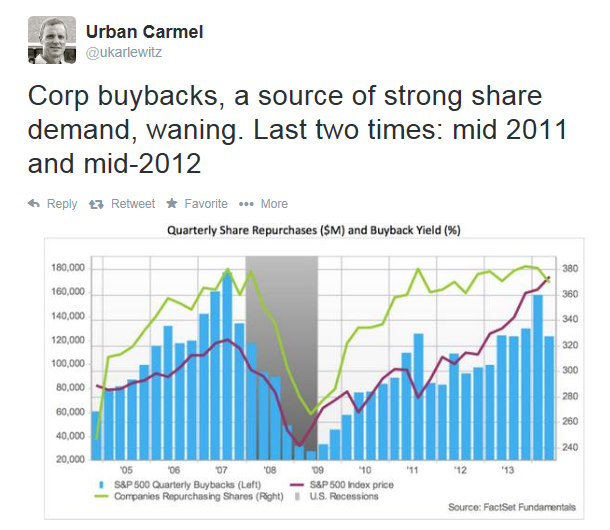 On the other hand, Urban Camel, writing at The Fat Pitch, pointed out that corporate buybacks are starting to wane and the last two episodes have coincided with falling stock prices. Share buybacks reduce the denominator in EPS and, without that tailwind, what will the effects be on EPS reports and earnings expectations? How will risk appetite evolve? 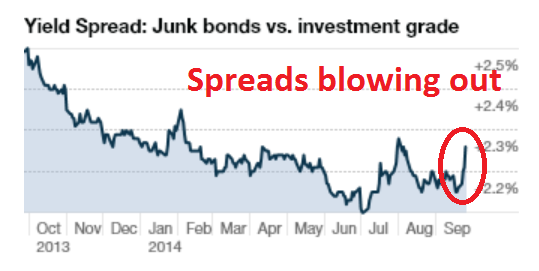 We recently saw risk aversion rise as junk bond spreads started to blow out. Is this a temporary condition or could USD strength be pressuring EM bonds and currency markets? 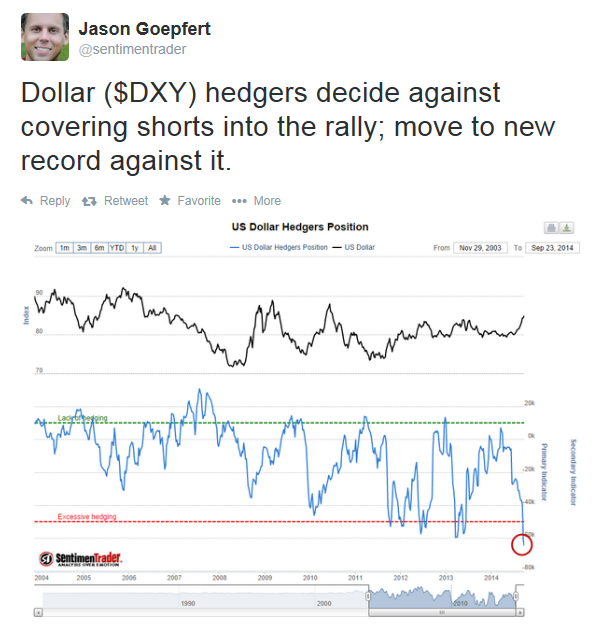 Despite the overbought and extended nature of the USD rally, Jason Goepfert reported that Dollar hedgers (the so-called "smart money") are piling into greenback strength. How will the geopolitical tensions develop? Winter is coming and will Russia and Ukraine reach an accommodation? How will the EU and NATO react? If global growth were to slow further and pressure oil prices downward, how badly will it hurt the Russian economy? These are all good questions that I am watching. In the meantime, my inner trader remains short the market, with tight stops. I will be tweeting live updates during the week at @humblestudent as markets conditions evolve. As the stock market got clobbered today, one of the things that my inner investor thought about was the kind of sectors that he wanted exposure to. Preferably, these sectors of the market should have a history of consistent outperformance and should be able to weather the stock market`s up-and-downs. It wouldn't hurt either if they had some growth characteristics as value sectors eventually appreciate and lose their value characteristics. There was only one sector that fit the bill: Healthcare. 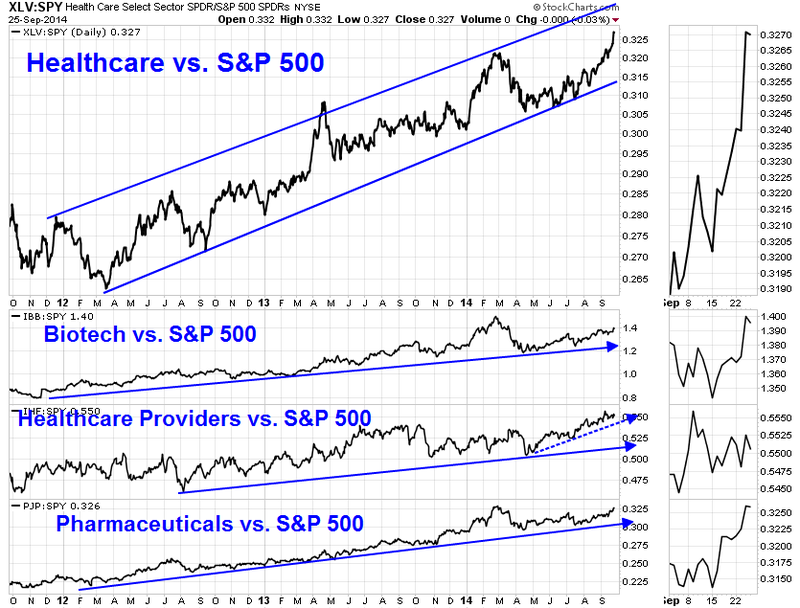 As the chart of the relative performance of the Healthcare sector (XLV) to the SPX shows, this sector has been in a well-defined relative uptrend and has shown consistent market leadership qualities. I also show the relative performance of specific industry groups within the sector, namely Biotech (IBB), Healthcare Providers (IHF) and Pharmaceutical (PJP). These industry groups, in all cases, show similar histories of outperformance, though IHF appears to be slightly extended in the short-term (dotted trend line). Having shown such a history of market outperformance, one concern that I had was that Healthcare could be in a bubble and therefore subject to sudden downdrafts as Technology did in 2000 and Financials did in 2008. When a particular sector outperforms the others, it grows as a percentage of the index and at the expense of its counterparts. But no one sector today is even 20% of the index. Tech stocks come closest, with 19.3% of the index. 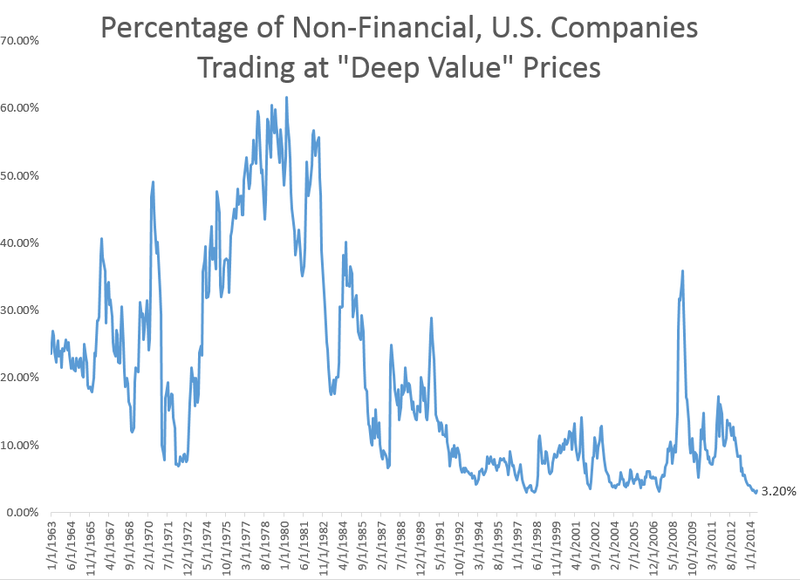 But this figure is far below the level of 14 years ago when tech claimed 32.6% of the index. Tech stocks have performed particularly well over the past year, gaining about 32% on average, but over the past five years both consumer discretionary/cyclical and health-care stocks have fared slightly better. Speaking of health care, even with its strong five-year returns (20% annualized on average), that sector’s weighting is also below its high. While never on par with tech or financials as a share of the index, that group did claim 15.5% of the index in March 2003 versus 13.4% currently. So there you are. Consistent market leadership that is not yet overdone. For long term market bulls, this sector and its industries might be just what the doctor ordered. A number of years ago, I worked as an equity portfolio manager at a Commodity Trading Advisor that used trend following models. While I knew nothing about the specifics of their models, I knew that the traders next door appeared white-knuckled at the end of the day. Even though they were diversified across many different contracts, the trading system often steered them into a single BIG MACRO BET. 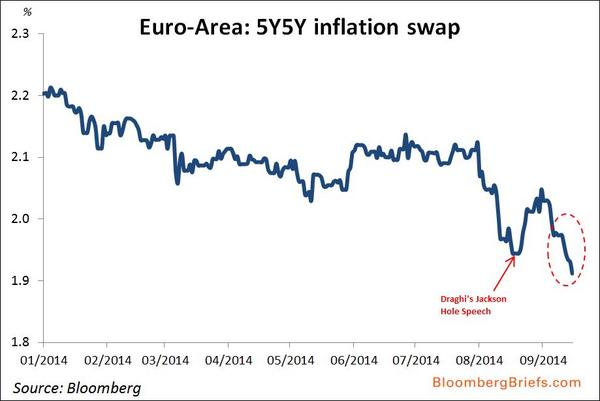 The bet might be characterized as a directional exposure to interest rates, or currencies, etc. It was then I realized that the application of trend following models on commodity, bond and currencies was picking up directional economic trends - but that's another story. I was reminded of that story when I was watching a technical analyst being interviewed on one of the financial TV networks and he was going through commodity charts, one by one. 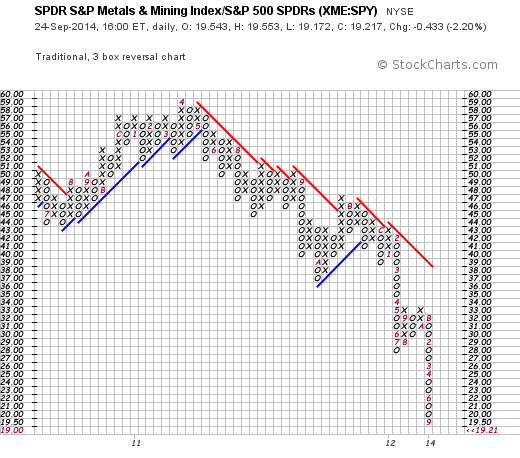 Here is the outlook for copper, oil, gold, etc. I wanted to shout, "No, no, no! Just watch the US Dollar!" In my recent post Overbought USD = Commodities poised to rally?, I wrote that the USD Index was highly overbought and coming up against major technical resistance. I postulated that the greenback was poised for a reversal and, as a result of its negative correlation to commodities, commodity prices were about to rally. It seems that I was wrong, at least on the short-term reversal. As the chart below shows, the USD has staged an upside breakout from resistance. A glance at the relative performance of the Energy sector to the SP 500 reveals its lackluster relative performance. Energy stocks have been in a relative uptrend in the context of a longer term sideways trading range. So what now? 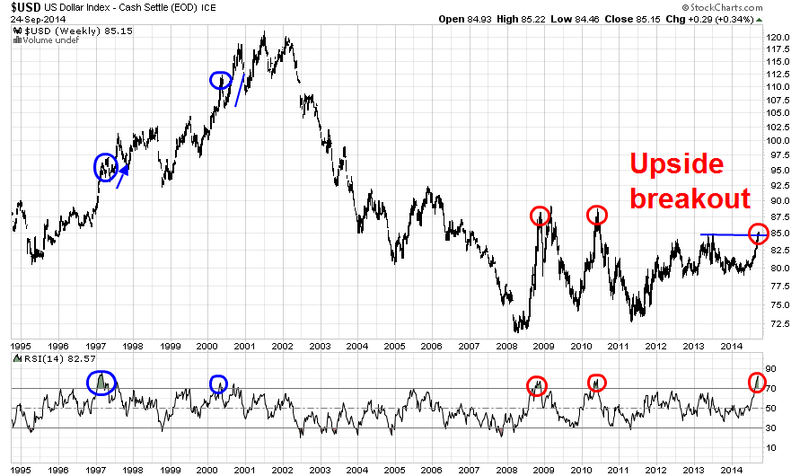 In light of a USD upside breakout, should commodity bulls throw in the towel and eat their losses? A look at the longer term 20-year USD chart shows several past episodes where the USD Index had reached similar overbought conditions. They all saw pullback soon thereafter. 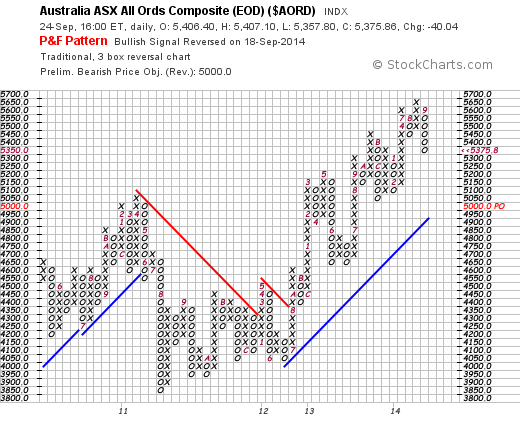 Some (marked in blue) saw further advances after the overbought condition was alleviated. The key issue is whether traders should buy or fade the anticipated strength in commodities. What is the near-term outlook for China, which is the biggest marginal consumer of commodities? What is the likely outlook for the USD? The AUDCAD currency cross gives us some clue about what Mr. Market thinks about China. Both the Australian and Canadian economies are commodity producers, but Australia trades more with China and Canada trades more with the US. The chart below shows the AUDCAD cross has violated a key technical support zone and it is in a downtrend. It does, however, appear to be trying to consolidate near a Fibonacci retracement level. While the AUDCAD cross appears to be telling a China-bearish story, a WSJ story that PBoC Governor Zhou Xiaochuan may be short-term China bullish. While Zhou has led many PBoC financial reforms, such as ending the USD peg and liberalized interest rate policy, which has started to end financial repression of the household sector, he has stood firm against wholesale stimulus efforts when the economy starts to slow, as it is doing now. It is rumored that President Xi would prefer the PBoC to be more accommodative during such periods and Zhou's replacement is more likely to induce more credit-driven growth during current periods of subpar growth - and that would be commodity demand friendly in the short-term. As for the second question about the likely outlook for the USD, Mr. Market considers the US a major locomotive of growth today. Consider this chart of the relative performance of the SPX relative to the MSCI All-Country World Index. 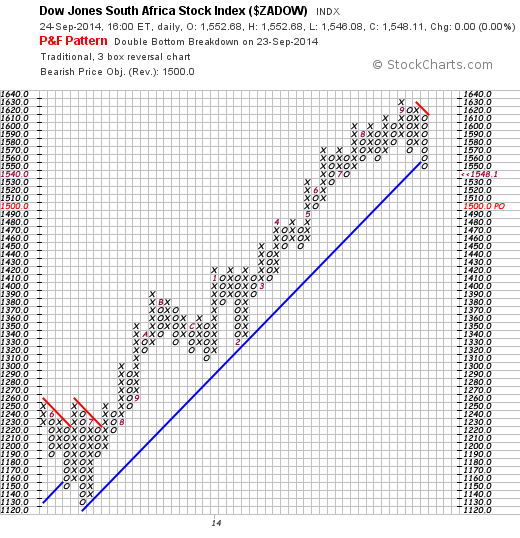 The SPX recently staged a relative upside breakout in the context of a long-term relative uptrend. As well, the US 10-year yield is roughly 2.6%, compared to 1.0% for the Bund, both of them considered to be the "risk-free rates" for global investors. Though the growth and monetary policy outlooks are very different for the two regions, The 1,6% differential is likely to attract funds to the USD and exert downward pressure on the EURUSD exchange rate. In conclusion, while the USD appears overbought and commodity prices oversold, my inner trader is positioning himself for the inevitable commodity rally, but my inner investor is positioning himself to fade the coming commodity strength as he is a longer term USD bull. Even if you have no currency or commodity positions, you should pay attention to how this USD/commodity trade develops. Rising commodity prices affect inflationary expectations, which feeds into the timing of Fed policy changes. 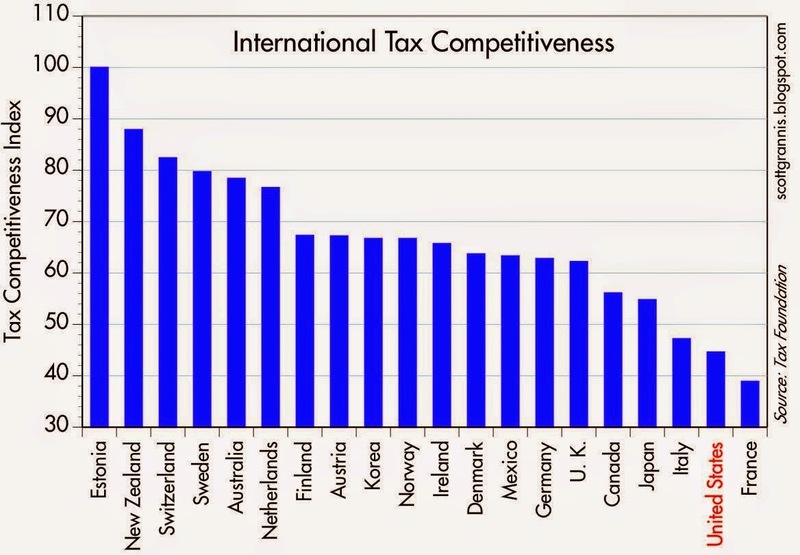 At 35%, the U.S. corporate income tax rate is the highest of any developed country. The fact that corporations are refusing to repatriate trillions of dollars of overseas profits is proof that it is negatively impacting the economy. Overseas profits have already passed through the tax tollgate once, but to subject them to another 35% just for bringing them back to the states is unconscionable to any responsible corporate executive. In an ideal world, corporate profits should not be taxed at all, since the burden of corporate taxes falls almost entirely on the customers and employees of corporations. In the end, only people pay taxes, and it's highly inefficient to tax businesses and individuals separately. Today, capital faces double and triple taxation: first on business profits, again when shareholders pay tax on dividends (paid out of after-tax profits) received, and again if and when capital gains are realized. Punitive tax burdens inhibit risk-taking and capital formation, and that in turn leads to slow growth. As for my views, the question of correct tax policy is way beyond my pay grade. What I do know is that when tax policy changes, it affects the economic ecosystem in subtle ways that investors might not expect. We view corporate and junk yields as insufficient to justify their additional credit risk at present levels, and we are particularly concerned at the increasing issuance of corporate debt to obtain what amounts to leveraged exposure to equities at historically extreme valuations (either through share buybacks or acquisitions). 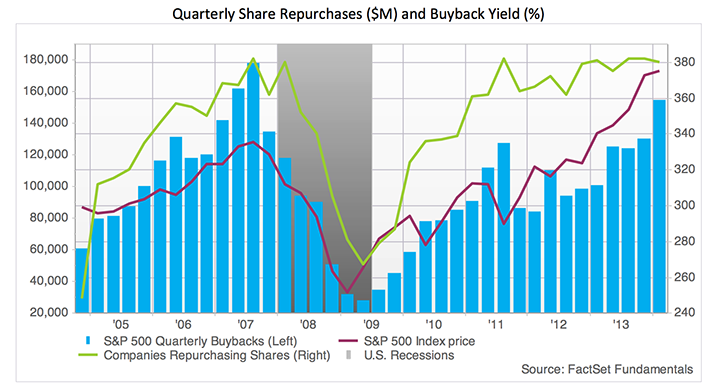 Buybacks are not a return of capital to shareholders – they are partly a leveraged speculation on shareholder’s behalf, partly a strategy to enhance per-share earnings by reducing share count, and partly a way to reduce the dilution from stock-based compensation to corporate insiders. Moreover, repurchases move in tandem with corporate debt issuance, which is another way of saying that the history of stock buybacks is one of companies using debt to buy their stock at overvalued prices. Keep in mind also that corporate share repurchases have no tendency to concentrate at points of depressed valuation, and but have instead been disproportionately aggressive at points that have historically represented severe overvaluation. 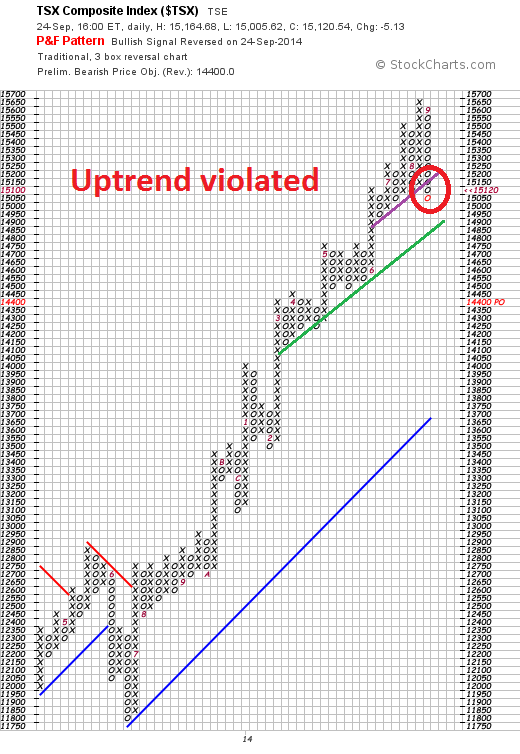 The chart below (h/t Thad Beversdorf) illustrates this regularity. See The Two Pillars of Full-Cycle Investing for additional data. Why does any of this matter? Whether Hussman's comments are on target or not, it does show that companies are buying back a lot of their own shares. In some cases, they are borrowing, or levering up the balance sheet to do so. Under the current tax regime, some CFOs may feel that they can lower their Weighted Average Cost of Capital (WACC) by shifting financing from equity to debt. In effect, CFOs are effecting a slow-motion LBO of their own companies. Hussman's comments are correct if companies are already at their optimal capital structure, but the perverse effects of option-related compensation incentives are pushing managements to overly stretch their balance sheet with debt. They are incorrect if these companies have excess equity and they are merely lowering their WACC by shifting their capital structure. With that preamble, now imagine that the GOP won a landslide victory in the Senate in November and they controlled the House. What would happen if the Republican dominated Congress were to lower the corporate tax rate? The economic ecosystem would shift and, in aggregate, CFOs would find the cost of equity cheaper compared to debt. They would therefore delever the balance sheet by replacing equity with debt. We would see more equity financing (and therefore more supply) while debt would get retired (especially if the Fed starts to raise rates). The net effect of such a shift could see a flood of equity financing that was beyond the capability of the market to absorb, and in light of a tightening Fed, spark an equity bear market. To be sure, there would be a bullish equity effect as lower tax rate as the market bids up equity prices. However, the effective corporate tax rate can be very low, though the notional rate is still relatively high, because multi-nationals have learned to lower their taxes by keeping cash in offshore subsidiaries. How whether the bullish re-rating effect overwhelms the bearish higher equity supply effect, or vice versa, I have no idea. The point of this post is that there are no easy answers in economics and tax policy. If you down on widget A, unpredictable effects occur and widgets G and K move up unexpectedly. Before you start writing nasty notes and emails to me, note that I wrote that lower corporate tax rates could lead to a bear market, not would. There are never any certainties in forecasting. However, investors should pay attention to possible perverse effects of a change in the economic ecosystem. The global economy faces a growing risk from big financial market bets that could quickly unravel if investors get spooked by geopolitical tensions or a shift in U.S. interest rate policy, the International Monetary Fund said on Wednesday. But it also warned that financial market indicators suggested investor bets funded with borrowed money looked "excessive" and that markets could quickly deflate if there were surprises in U.S. monetary policy or the conflicts in Ukraine and the Middle East. As the IMF put it in its technical language, "New downside risks associated with geopolitical tensions and increasing risk taking are arising." These warnings have been heard before, most recently from Seth Klarman (also see yesterday`s post 3 reasons to get more cautious on stocks). 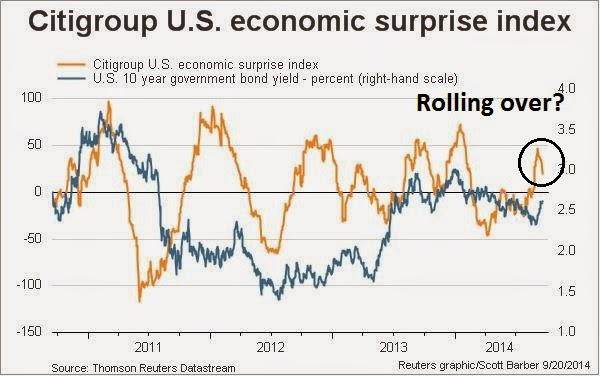 So what happens when the Fed stops QE and starts to tighten? In my remarks, I will argue that monetary policy faces significant limitations as a tool to promote financial stability: Its effects on financial vulnerabilities, such as excessive leverage and maturity transformation, are not well understood and are less direct than a regulatory or supervisory approach; in addition, efforts to promote financial stability through adjustments in interest rates would increase the volatility of inflation and employment. As a result, I believe a macroprudential approach to supervision and regulation needs to play the primary role. Such an approach should focus on "through the cycle" standards that increase the resilience of the financial system to adverse shocks and on efforts to ensure that the regulatory umbrella will cover previously uncovered systemically important institutions and activities. These efforts should be complemented by the use of countercyclical macroprudential tools, a few of which I will describe. But experience with such tools remains limited, and we have much to learn to use these measures effectively. The Federal Reserve has created a committee led by Vice Chairman Stanley Fischer to monitor financial stability, reinforcing its efforts to avoid the emergence of asset-price bubbles. Joining Fischer on the Committee on Financial Stability are Governors Daniel Tarullo and Lael Brainard, according to the central bank’s latest Board Committee list. Fed officials want to ensure that six years of near-zero interest rates don’t lead to a repeat of the excessive risk-taking that fanned the U.S. housing boom and subsequent financial crisis. As the economy recovers and the Fed begins to normalize interest rates, it will be the job of these macroprudential policies to combat and mitigate the effects of any financial bubbles that easy monetary policies may have blown. Will this approach be successful, or will the markets have to endure another crash because of miscalculations at the Fed? One way investors can gauge the likely success is to watch the UK experience. Britain appears to be slightly ahead of the US in its economic recovery cycle. But exit is not without its risks and dangers, especially after a long period of very low interest rates and low market volatility. And exit is likely to occur at different times in different jurisdictions globally, adding to the complexity and potential complications. As I emphasized earlier, it’s the tail risks – the unusual developments – that often pose the greatest threats to financial stability. The question is whether the long period of low rates and low volatility has led to a mispricing of risks through reaching for yield, herding, or other types of behaviours. If it has, the potential for very sharp adjustments would be higher, with possible unanticipated consequences for both borrowers and lenders. Never before have the monetary authorities engaged in the sorts of unconventional policies that have been widely utilized over the past six years. So, none of us has any experience with the asset price movements associated with the policies, or those that could occur as they are exited. As noted, the complexity of forward planning and risk management is heightened by diverging economic prospects around the globe. Most likely all will go well; unconventional policies will be unwound with only the sorts of gains and losses that usually accompany policy shifts and don’t threaten financial stability. But this is an unusual challenge for both the authorities – including new macroprudential authorities like the FPC – and the private sector. One that we must get right. The task of exiting such an unprecedented level of stimulus after the Global Financial Crisis is the greatest challenge facing the Federal Reserve and global central bankers. Will macroprudential policies work? I have no idea. No doubt the risk of a policy mistake is enormous, but at least investors have the UK as a laboratory of what might go wrong. It’s like if the tree in the backyard has a crack in it, you worry it’s vulnerable to a storm. But if no storm happens, it goes on and on, and maybe eventually strengthens through growth. If the right storm comes along and knocks it onto your neighbour’s house you’ve got a problem. The the possible growth scare scenario is the catalyst that could wake the hibernating bears. I have written before about how US equities appear expensive on a P/E, P/B and dividend yield viewpoint (see More evidence of a low equity return outlook) and those conclusions haven`t changed. Valuations are elevated, though not crazy high, which indicates that investors should lower their long term equity return expectations. "I think that Silicon Valley as a whole, or that the venture-capital community or startup community, is taking on an excessive amount of risk right now—unprecedented since '99," said Bill Gurley, a partner at Benchmark, referring to the last tech bubble. The most obvious one is just the acceptable burn rate. And that can be seriously, negatively reinforced by the capital market. In the software-as-a-service world, where the risk is potentially among the highest, Wall Street has said it's OK to lose tons of money as a public company. So what happens in the board rooms of all the private companies is they say, "Did you see that? Did you see they went out and they're losing tons of money and they're worth a billion. We should spend more money." And there are people knocking on their door saying, "Do you want more money, do you want more money?" In today’s ebullient markets, we see many investors ratcheting up their own risk levels–buying substandard credits and piling up leverage are two favorite methods–in an attempt to generate near-term performance. To confirm Klarman's view, I am seeing pockets of crowded long positions in risky assets. 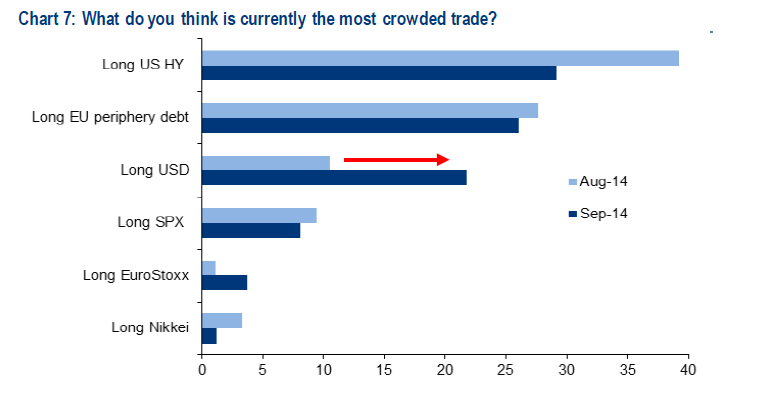 The BoAML Fund Manager Survey shows that the two biggest crowded long trades are US HY, or junk bonds, and eurozone peripheral debt, which could cause concern for the market in light of the disappointing TLTRO results. Bill Gross is relying on derivatives rather than Janet Yellen to raise his returns on government bonds. The co-founder of Pacific Investment Management Co. sold most of the $48 billion of U.S. Treasuries held by his $221.6 billion Pimco Total Return Fund (PTTRX) in the second quarter, replacing them with about $45 billion of futures, according to an August filing. The contracts require small up-front payments, freeing up money for Gross to invest in higher-yielding securities including Brazilian, Spanish and Italian debt. As well, read this Bloomberg report on how investors, desperate for yield, are plunging into the illiquid world of bank loans. Aside from the excesses of institutional behavior, the American individual investor is nearing a crowded long position in equities. Lance Roberts recently pointed out that that US households have equity positions equal to pre-Lehman Crisis levels and cash allocations are at near historic lows. 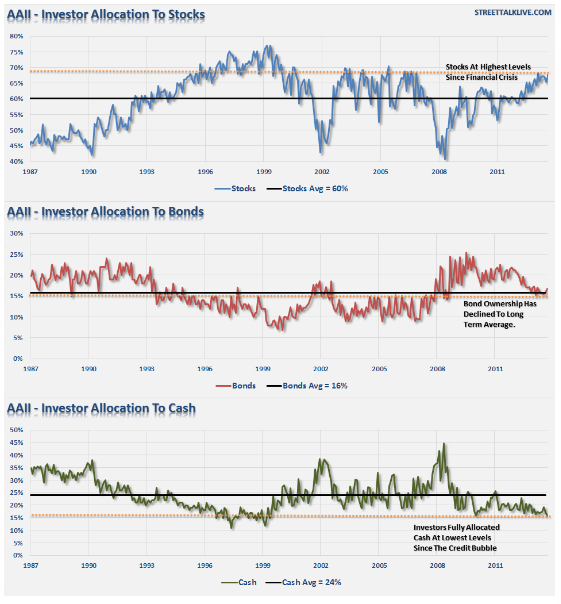 Dana Lyons confirmed the conclusions of the AAII asset allocation survey with this analysis and pointed out that US households are most invested in stocks since 2000, the year of the NASDAQ peak. What is the significance of the current reading? 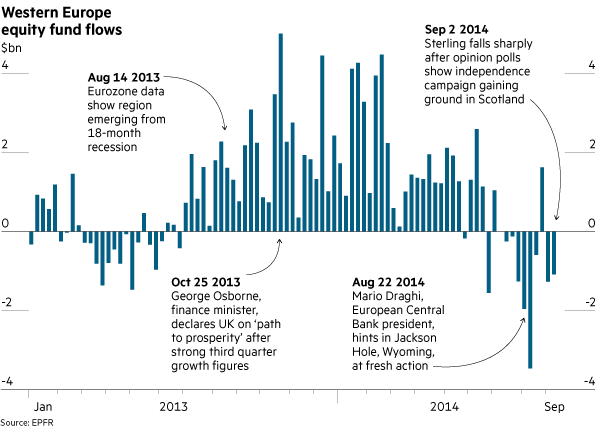 As we mentioned, it is the highest reading since 2000. Considering the markets are at an all-time high, this should not be surprising. In fact, while most of the indexes surpassed their prior peaks in early 2013, household stock investment did not surpass the 2007 highs until the first quarter of this year. The financial crisis put a dent in many investors’ psyches (along with their portfolios) and they’ve been slow to return again. However, along with market appreciation, investor flows have seen at least streaks of exuberance over the past 18 months, boosting investment levels. Yes, there is still room to go (7.5 percentage points) to reach the bubble highs of 2000. However, one flawed behavioral practice we see time and time again is gauging context and probability based on outlier readings. This is the case in many walks of life from government budgeting to homeowner psychology to analyzing equity valuations. 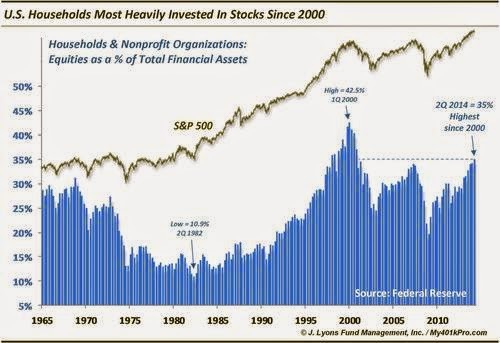 The fact that we are below the highest reading of all-time in stock investment should not lead one’s primary conclusion to be that there is still plenty of room to go to reach those levels. Having set the stage that, in effect, there is a crack in the backyard tree, the tree could stay up indefinitely. In order for the tree to go down, you need a storm. Sina.com reported that the PBOC provided the funds under a program called the standing lending facility, introduced last year as a collateralized provision of funds to meet large-scale demands for financial institutions’ long-term liquidity and to help address fluctuations in money-market rates. While the action was probably driven by considerations including economic weakness and liquidity volatility around the weeklong National Day holiday that starts Oct. 1, the fact that the PBOC used the SLF instead of a cut in banks’ reserve requirements suggests that the “central bank does not want the market to interpret it as a clear sign of monetary easing,” JPMorgan Chase + Co. economists wrote in a report. The central bank has left reserve requirements for the largest banks and benchmark interest rates unchanged for more than two years. China bulls may point to the fact that commodity prices face a headwind because of the strength in the USD, a fact that I recently highlighted (see Overbought USD = Commodities poised to rally). One way of untangling the China effect from the USD effect on commodity prices is to focus on the AUDCAD exchange rate. Both Australia and Canada are resource based economies of similar size, but Australia is more China sensitive while Canada is more US sensitive. As the chart below shows, the AUDCAD shows a technical breakdown through a key support level and it is falling with little sign of a bottom in sight. MSCI China has outperformed the developed market stock index (the MSCI World Index) by about 11% since the middle of March. Over that period the percent of stocks outperforming the World Index increased from a paltry 14% to an elevated 79% (blue line in the chart below). 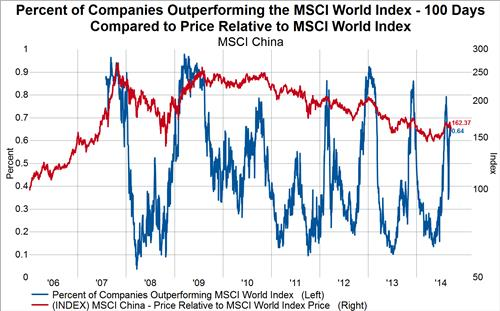 In the past, when the percent of stocks in the MSCI China outperforming the MSCI World Index reached around 80% the relative outperformance was all but over and a new downtrend resumed. We are careful not to call for a renewed downtrend in Chinese stocks, but perhaps they are ready for a breather. Bottom line: Don`t count for any help from China on global growth expectations. Sterling and the stock market rose, of course — but not by much in the end. The FTSE 100 didn’t set any records, as some had hoped, and the pound soon began to reverse its gains. Why? The first drag was expectations. The financial and betting markets had been pricing in a No vote with a very large probability; once again, it was confirmed that the weight of money is far more powerful a barometer of public opinion than the analysis of specialist pundits. The wisdom of the crowd — at least the cash-rich, let’s put our money where our mouth is variety — does work. The pound recovered the ground it had recently lost — but within hours, traders were once again focused on all of the usual big global macro issues. The business community faces several other issues. In the long-run, the chances of a Brexit — a UK exit from the EU — are now higher than they were, though not as high as if Scotland had voted Yes. It is clear that campaigners can make huge headway even if the establishment is against them. Expect the Out campaign to use a similar strategy to that embraced by Mr Salmond — though with actual facts and genuine arguments this time, rather than bluff, bluster and denial. Across the English Channel, the ECB's TLTRO auction was a major disappointment as the amounts were far less than expected. TLTRO injected €83b into the eurozone banking system, but the banks prompted repaid €20b of LTRO money the next day. 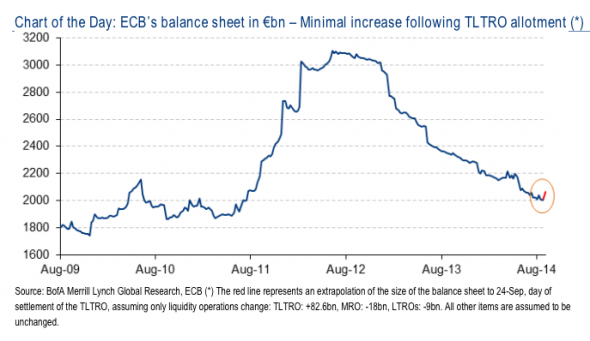 The market's hope that TLTRO would be a QE program that would significantly expand the ECB balance sheet were shattered. The FT highlighted the fact that money has been coming out of European equities. These recent developments are likely to exacerbate the trend toward further withdrawal. I had written that since the intent of the TLTRO is to stimulate local businesses and SMEs, European small caps may benefit (see Time for European small caps to shine?). Oh well, in light of the disappointing TLTRO results, maybe next time. 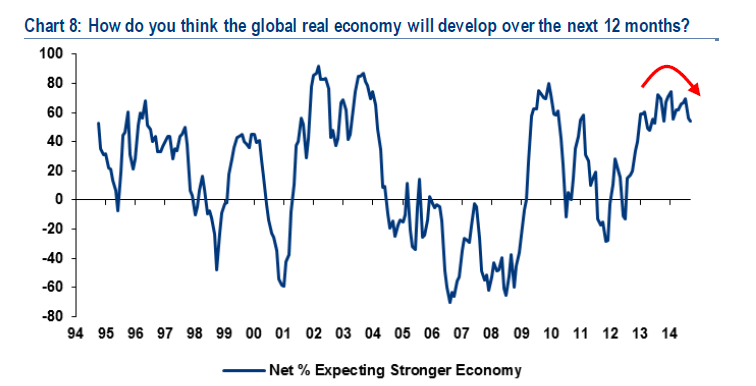 Don`t expect Europe to contribute positively to global growth. While the BCI model still shows the U.S. economy has a very low probability of recession and is on a path of moderate growth amid low inflation, the growth path is a touch more muted because of the soft consumption and nonfarm payrolls release. However, this is seen as more noise than signal. What's more, the Atlanta Fed's GDPNow, the "nowcast" of Q3 GDP, continued to fall. The latest reading on September 18 was 3.2%, down from 3.4% on September 12 and 3.6% on September 4. Falling macro growth expectations will eventually translate to a loss of EPS momentum. While bottom-up estimates remain relatively upbeat right now, investors should be prepared for downgrades in the near future as growth headwinds intensify. 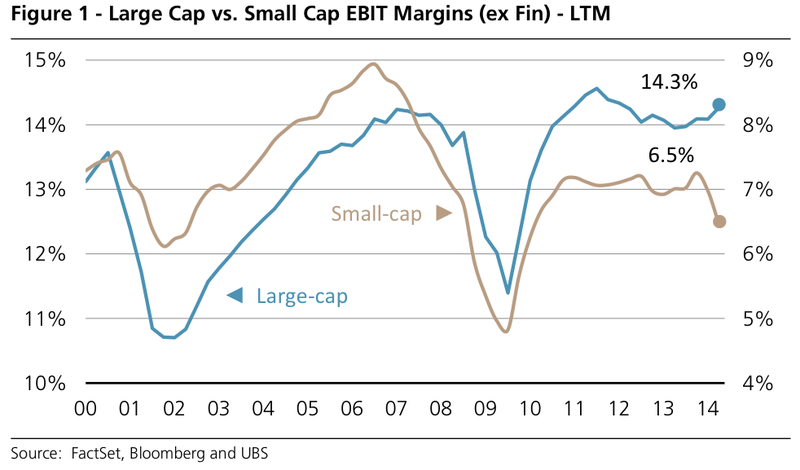 While the characteristics of US large and small capitalization stocks are not directly comparable, this chart from UBS shows the differential in EBIT margins between the two. Should foreign growth start to slow, large and small cap EBIT margins will likely start to converge, with large cap margins falling toward their small cap counterparts for cyclical reasons. Should we start to see an operating margin squeeze because of a weakening economic cycle, large caps will likely see a double whammy of reduced risk appetite, which would then see PE ratios compress. For another perspective, see this Marketwatch article showing the concerns of the effects of greenback strength on Consumer Discretionary stocks like NIke. The combination of heightened valuation, crowded long positions in selected risky assets and falling growth expectations are negative for the stock market outlook. 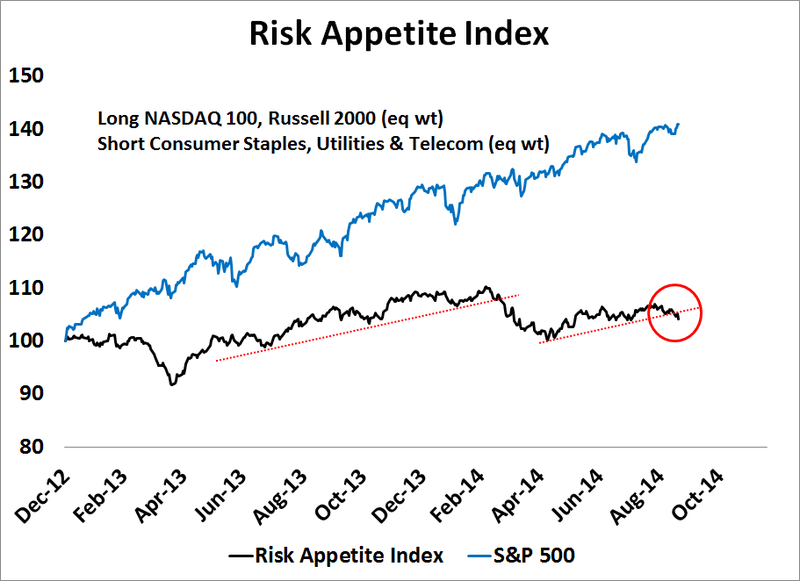 Indeed, my Risk Appetite Index, which consists of a long position in high-beta NASDAQ 100 (QQQ), Russell 2000 (IWM) and short positions in Consumer Staples (XLP), Utilities (XLU) and Telecom (IYZ), is starting to falter. 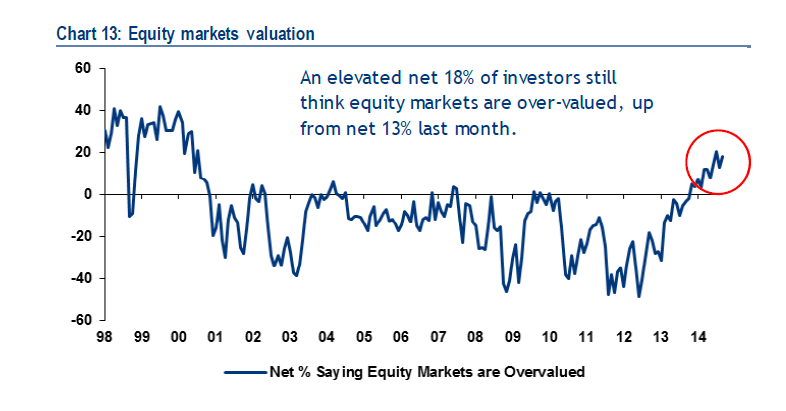 The BoAML Fund Manager Survey shows another point of US equity market vulnerability. 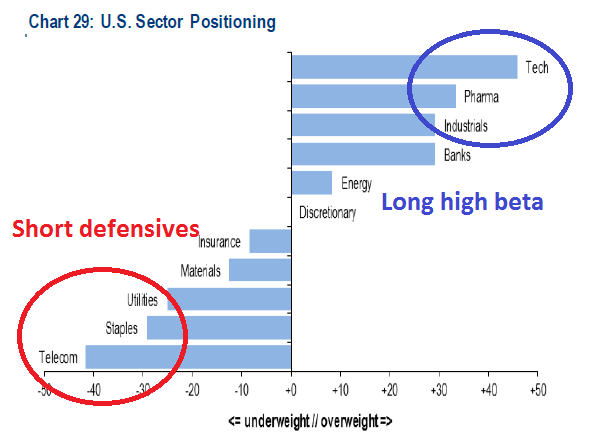 Institutions are overweight high-beta sectors and underweight defensive low-beta sectors. Should the environment change from risk-on to risk-off, the adjustment could be violent and disorderly. When I put it all together, the weight of the evidence suggests that equities are poised for a pullback of unknown duration and magnitude. However, bulls can be console by the fact that there is no recession in sight and therefore the risk of a major bear market is minimal. Last week, I wrote that my Trend Model was turning tactically bearish (see A tactical sell signal, but no signs of a major top) but equities rallied on news. However, it was an event laden week and traders had to be nimble. 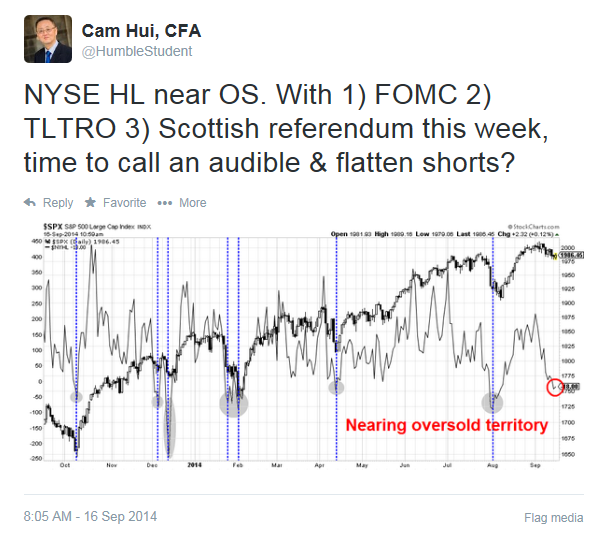 On Tuesday, I tweeted that given the SPX was approaching a short-term oversold condition, it may be time to “call an audible“ and flatten short positions (follow me on Twitter at @humblestudent for real-time updates). My inner trader is bearishly positioned and believes that the market is poised for a pullback of unknown proportions. If recent history is any guide, the pullback is likely to be a mild hiccup of about 5%. If equity market weakness materializes, he is watching how growth expectations evolve and how short-term sentiment indicators develop. How serious will the downgrades be? 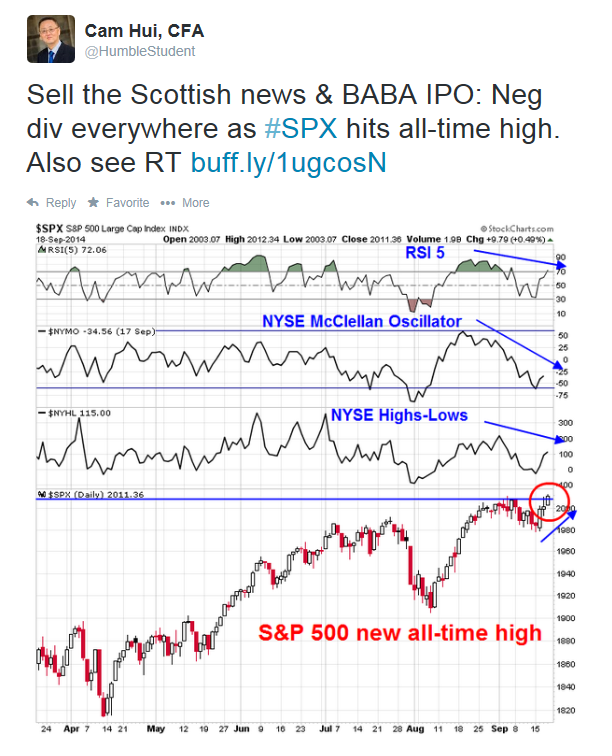 Will the markets panic as they did recently (see sentiment comments in A tradable bottom? ), which would be contrarian bullish, or will complacency set in, which would be bearish? My inner investor is not worried about minor market blips and he remains bullish as the long term US outlook remains positive (see Gene Epstein's column in Barron's for a good summary). He is, however, watching carefully how growth expectations evolve. If they were to decline significantly, it would be a sign to de-risk his portfolio.